Toyota looks like determined to make its well established image as a hybrid-global-leader with its newly released Toyota RAV4 Hybrid 2016. Equipped with two powertrain options, the model provides remarkable fuel efficiency and is adorned with a sportive body. While the Hybrid terrain is an attraction on one side the fuel efficiency figures is another. 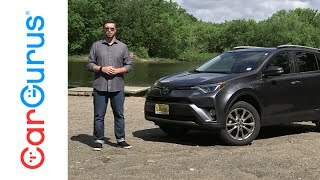 Let us have a look at the review of Toyota RAV4 Hybrid 2016 to know in detail about it. The interior of Toyota RAV4 Hybrid 2016 offers few changes in comparison to the standard RAV4. Keeping almost everything same form the charging USB ports to upholstery, the major change can only be noticed with the new instrument cluster. Apart from this there’s one more thing that I noticed and it is the lots of space for passengers and the cargo. As said earlier rest everything remains almost the same. The busy dashboard with rounds of controls and the comfortable, padded and stitched upholstery that also looks gorgeous. However use of plastic makes the interior look bit cheap but it in all, the interior details of Toyota RAV4 Hybrid 2016 are pretty impressive in context to comfort. The exterior of Toyota RAV4 Hybrid 2016 unlike its interior is a lap ahead of the standard model. Let us start with the front fascia where I noticed major changes. It has the same traditional grille amidst the smaller headlights. The front end has been given an edgy appearance. There is also a slit-like opening between a massive center badge while the slim vent above the bumper like is also an appreciable addition. Moving towards the rear end you’ll notice minor redesigning in form of shape. This includes new bumper and the set of new taillights. 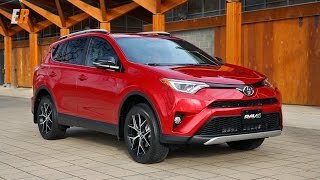 In all with these changes and the new exterior color treatment, the exterior of Toyota RAV4 Hybrid 2016 is a good blend. 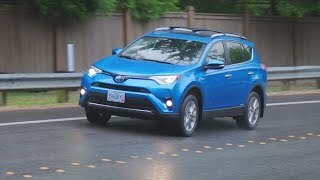 Powering the Toyota RAV4 Hybrid 2016 are two drivetrains; first is a 2.5 liter four-cylinder engine generating total output of 176 hp and is paired to six-speed automatic transmission. 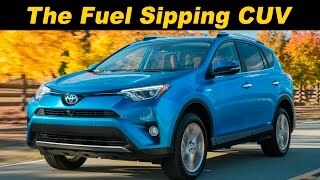 With this engine the top speed of Toyota RAV4 Hybrid 2016 112 mph and can sprint from 0-62 mph in 8.7 seconds. The second is a hybrid powertrain and includes a 2.5 liter engine generating 154 hp and a 67 hp electric motor. 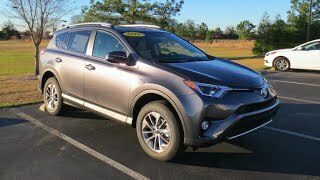 Thus the total output of Toyota RAV4 Hybrid 2016 comes to 197 hp. With this the sprint time of 0-60 mph falls to 8.1 seconds only.